Mineola is a village in Nassau County, New York that borders Carle Place, East Williston, Garden City, Garden City Park, Herricks, Old Westbury, Roslyn Heights, Westbury, and Williston Park. The village has a population of roughly 19,100 people. Village residents have an average household income of $89,706, and a median age of 41.7. The median property value in Mineola is $438,900, which is 2.14 times larger than the national average of $205,000. Two transit-oriented housing developments have already been constructed and occupied, with two more apartment rental buildings in the works slated for completion in 2019. 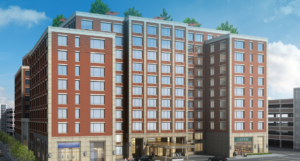 One Third Avenue, a large 312-unit residential and mixed-use development, and The Allure Mineola are two luxury apartment buildings recently constructed in Mineola Village on Old Country Road, one block from the Mineola train station. The Village Green, a 266-unit apartment building that will also have a central lawn with event space is being built just north of the station along Second Street, and a 192-unit development is slated for the former site of a local Elementary School on Searing Avenue. Another project currently in construction in downtown Mineola is a 550-space garage at First and Third Avenue. This project, along with a proposed 350-450-space garage to be located at Second Street between Willis Avenue and Main Street, will make finding a parking spot in downtown Mineola much, much easier. Parking has been a struggle in Mineola with many of the existing lots accommodating employees and patients at NYU Winthrop Hospital, LIRR commuters, and downtown business patrons. These two lots will be a huge boost for downtown Mineola.